Mildly encouraging news for Earthlings hoping to escape the scorched ruins of our own planet: A team of astronomers has found evidence for four Earth-sized (ish) worlds orbiting tau Ceti, a Sun-like star located just 12 light years away. Two of these planets, the researchers say, might barely be on the edge of the habitable zone, that not-too-hot, not-too-cold region that can potentially support liquid water and even life. But this isn’t tau Ceti’s first rodeo, and some of the experts Gizmodo spoke to suggested we shouldn’t get too excited about the latest claims that this intriguing star system might be habitable. A nearby star roughly three quarters the mass of our Sun, tau Ceti has a complicated history when it comes to extrasolar planet discovery. In 2012, astronomers announced they’d found evidence for five planets between two and seven times the mass of the Earth, using the so-called radial velocity or “wobble” method, which measures the gravitational tug a planet exerts on its star. Two of those worlds, tau Ceti e and f, were thought to possibly be at the right distance to harbor liquid water, although with mass estimates of 4.6 and 6.6 Earths, these potential worlds probably weren’t rocky. What’s more, later modeling efforts indicated that both planets likely orbited on the extreme edges of the habitable zone, at best. 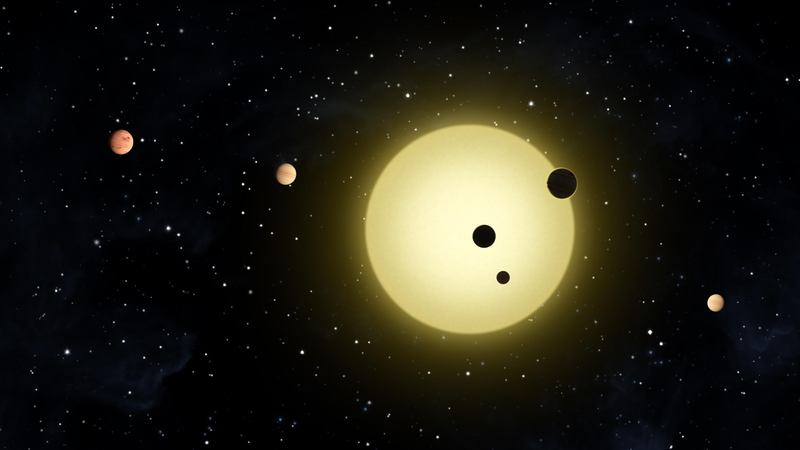 The new research, led by astronomers using the HARPS spectrograph at the European Southern Observatory and the Keck Observatory in Hawaii, offers more indirect evidence that at least four planets really do exist. Two of those planets, tau Ceti g and h, are newly described, whereas tau Ceti e and f are the same ones described previously, but now with lower mass estimates (a minimum mass of 3.9 Earths for each). One of the new planets might have a mass as low as 1.7 Earths. “We are now finally crossing a threshold where, through very sophisticated modeling of large combined data sets from multiple independent observers, we can disentangle the noise due to stellar surface activity from the very tiny signals generated by the gravitational tugs from Earth-sized orbiting planets,” study coauthor Steven Vogt, professor of astronomy and astrophysics at UC Santa Cruz, said in a statement. Importantly, the existence of the planets still needs to be confirmed via direct imaging. And, as before, the claim that tau Ceti e and f might reside in the habitable zone is already being contested. As far as habitability goes, the researchers themselves point out another problem: due to the massive debris disk surrounding tau Ceti, the outer two planets are likely subject to intense bombardment via comets and asteroids, which would pose obvious issues for life. Clearly, more work needs to be done to confirm the existence of these hypothetical worlds, and determine what they’re really like. But even if none of tau Ceti’s planets are remotely habitable, the existence of such nearby cosmic neighbors would be a boon to search for life beyond Earth. The four planets claimed in the new paper would be among the smallest, and hence most “Earth-like,” ever spotted around a star like the Sun. Many of the other “potentially habitable” exoplanets discovered to date orbit dim red dwarf stars, which, for a variety of reasons, could prove hostile to life. “Tau Ceti is the nearest Sun-like star to the Sun and finding habitable planets around it is exciting,” Avi Loeb of Harvard’s Center for Astrophysics told Gizmodo, although he too noted that their habitability is, right now, a question mark. Most importantly, as Feng explained via an email exchange shared with Gizmodo, the research pushes the limits of the sorts of planets we can detect with the radial velocity method, boosting our prospects of discovering truly Earth-sized, rocky worlds in the future. “The most important discovery in this work is that we have detected the weakest signal and are reaching the limit of detecting Earth analogs using radial velocity method,” Feng said.